I wanted to bring to your attention something I learned about recently that might be of interest to you. Local and national humanitarian organizations help coordinate "gleanings" in the fall to distribute food to the poor or needy. 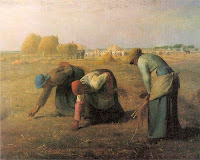 For those who have never heard of it before (like me), gleaning is the act of collecting leftover crops from farmers' fields after they have been mechanically harvested or on fields where it is not economically profitable to harvest [from Wikipedia]. You may be able to find something similar in your area if you want to get out in the fields and help out some hungry people. What a great idea! Thanks for sharing it. There are a lot of farms around me, I'm sure something like this is here.